Far from the noise being made in America and Britain about Abdelbaset Ali al-Megrahi's arrival to a joyful public welcoming in his country, Tripoli has been quiet as it observes the first day in the holy month of Ramadan. There is a verbal storm raging on in the US and in the UK: a public relations nightmare, perhaps, for all the governments linked to the Lockerbie case. People here believe Megrahi is an innocent man. The streets have been silent throughout the day and many Libyans will be unaware of the outrage that is playing out abroad. For the local population, their brother is home, he is dying and he will spend his remaining days with his family and amongst his people. That is where the story ends for them. But it seems like a harsh new beginning for the relatives of the Lockerbie bombing victims. Most are opposed to Megrahi's release and return to Libya, but for this country it is seen as a resounding victory, albeit a muted one on an official level. Libyan authorities have maintained their silence on the release of Megrahi from a prison in Glasgow. Megrahi's daughter Ghada told the BBC he was at home with his family. "He is at home with us, he is a bit tired and worn out because it was a slightly long trip for him," she said. "He's come home to young adults whom he left as children [referring to her younger brother who was five at the time his father was jailed] and he was overjoyed with seeing us all again." Right up until the plane landed in Tripoli's Maitiga airport, she "did not believe it would happen". His elderly mother is said to have been very excited and happy to see him again. "This is the joy of our lifetime", Megrahi's daughter said. Some time after midnight on Thursday, hours after Megrahi touched down on Libyan soil, the state-owned mobile phone network al-Madar sent a text message to its subscribers. 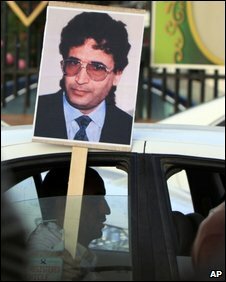 "Abdelbaset Ali al-Megrahi is free in the adored Libyan land," the message read. Libya has two state-run mobile phone networks and both have a tendency to bombard the population here with a variety of local information and reminders, including anniversaries of what are deemed to be historic events. The text message will almost certainly have been sanctioned higher up in the chain of command. So too would have been the statement posted by Seif al-Islam Gaddafi on the Gaddafi Charity Foundations website, where he expressed his appreciation of the British and Scottish governments for Megrahi's release. A courageous step, he called it. But it is increasingly looking like a step too far for most of relatives of the 270 people who perished on the Pan Am flight. There has been official condemnation on both sides of the Atlantic of the joyful welcoming scenes broadcasted around the world. Some would say these are words aiming to calm tensions, tailored to suit public opinion on a local level. Both America and the UK have already charged ahead in their ties with Libya. They have broadly committed themselves to this North African country rich in oil and gas. In these harsh economic times, an extensive fall-out is highly unlikely. An abnormal scene to many abroad perhaps, but the fact remains that relations between Libya and the West at large have long been normalised.